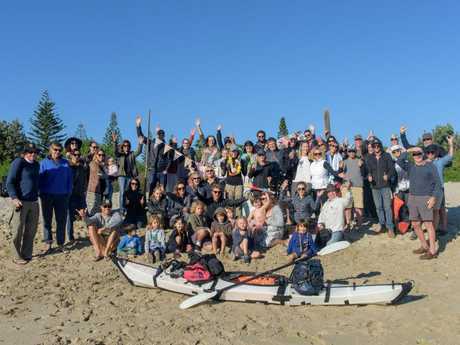 THERE were loud cheers, and a few tears as Hayley Talbot paddled her corflute kayak into Whiting Beach this morning. With the song "Happy" playing, she raised her paddle in the air as she reached the end of her almost 400 kilometre journey from the source of the Clarence River nearly two weeks ago, and was greeted by her husband and two children, as well as family and friends from the community. "It's overwhelming," she said. "I think I've visualised (arriving home) so many times I had this idea of how it was going to play out, but it was nothing to how it actually was." Husband Michael Talbot said that his wife was an inspiration not just for the community but their family and kids. "What we try to instil in the kids is to do what you say you're going to do and enjoy the journey," he said. "She's been doing it for two years...and there's been a lot of times she could've given up, but she pushed on through a lot of people saying it's too dangerous don't do it...but she completed what she said she would, and it's a massive milestone." Fighting back tears, Mrs Talbot said she was inspired by the people who helped her along the way in her solo paddle trip, and gave thanks to everyone who turned out to greet her. "I've set out on this crazy one-woman adventure and it's just been this unbelievable journey of humanity," she said. "I get really emotional...because I'm just one person that paddled the river and I can see how many people are proud of me, and I hope I set the example I wanted to set which is if you have a dream and you work hard and don't give up it'll come true."